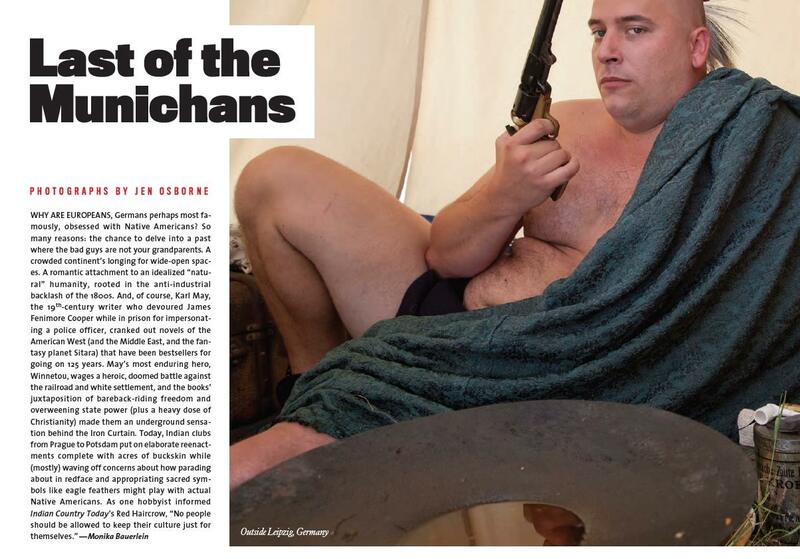 A brief reference, but a reference, in the July/August edition of Mother Jones Magazine article “Last of the Munichans” with photos by a colleague, Canadian photographer Jen Osborne. While it is absolutely true that some Germans (or other Europeans) are sincerely looking for connection to native peoples, wishing to learn different, healthy ways of living, physically and spiritually, there are others who combine problematic aspects of German society past and present in their practices. Colonizer privilege. On the topic of Indian hobbyists, cultural appropriation and why some people do it and vehemently feel they have the right to be “Indian hobbyists”, with some even make up “native sounding” names, choosing a tribe, and gathering a following by saying they’re native (when they’re really German, etc.). Some ignore or don’t seem to care what harm such practices can cause both natives and non-natives, negatively influencing their next generation of with “half-truths”. One of the most important things they dismiss or won’t acknowledge, and what causes frustration for natives when anyone does this (and its a huge problem) is the way any minority might feel when someone is pretending to be them: They have not lived with the centuries of oppression, racism and genocide, much of which is still on-going for Native Americans. Until 1978 in the USA, it was considered a criminal, arresting offense to practice our beliefs and ceremonies, and our many of our dances, our patterns, our symbols, clothing or regalia are part of our beliefs. Residential schools, assimilation concentration camps children over the age of 4 were taken from their communities were not closed in the USA until thr 1980s. In Canada until 1996, native children were still forcibly or coercively taken away from their parents and communities. Other on-going genocidal, ethnocial and racist treatments continue such as policies and laws that force adoption and fostering of native children with white families. Posted in Activism, Culture, Germany, Indigenous, Native American. Tagged cultural appropriation, cultural disrespect, cultural ignorance, german indian hobbyists, indian hobbyists, native americans.